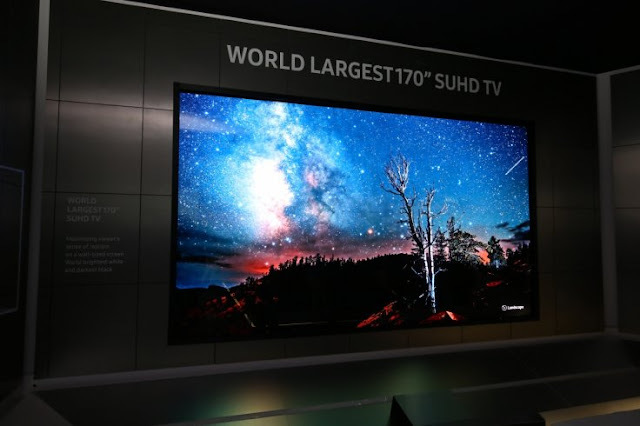 CES 2016 is not only Automobiles or Mobiles, Televisions have been a big part of it. Samsung has unveiled a big 170-inches SHUD TV. Well, there is one thing to note, it is not one TV, it is actually made up of several screens. if you looks at the image it is indeed difficult to tell the bezels of the screens present. According to IBTimes "We were happily unaware of the fact from no more than a meter away and only until we were told and had to get right up close to see any faint division in the huge display". Samsung has been good at Displays, Samsung's Galaxy Note line like Note 5 and Galaxy S6 Edge plus have one of the best smartphones displays existing in the market. Samsung assembled this massive size TV with number of latest innovation of bezel-free technology, where the numbers weren't revealed. But it was good to see.